Moving within Canada? You don’t need to do it all. Our full service residential moving services will make your move a lot easier and less stressful, for both you and your family. You don’t need to lift a finger or move a carton unless you want to. From carefully packing your delicate china, to crating your flat screen TV, to shipping your vehicle, we can take care of every part of your move. Your first step is to contact us to arrange a free in-home estimate with a Lindsay-Peterborough Movers & Storage Consultant. Your Consultant will meet with you at your home to explain our services and do a visual survey of the items you need moved. Your Consultant will also answer any questions you may have about the moving process, discuss shipment protection options and provide you with a professional cost estimate based on cargo weight and the distance of your move. Additional services such as crating, appliance servicing, vehicle transportation, and storage are also available. Additional services such as crating, appliance servicing, vehicle transportation and storage are also available. We’ve been a part of the community for years, so we have experience and best practices when it comes to moves in and around the Peterborough area. Local moves are charged based on an hourly rate for a van and two or three professional movers, including travel time from our office to your home. Each move includes 200 furniture pads to protect your belongings, free wardrobe cartons for your hanging clothes, floor protectors, and specialized equipment to help your move go quickly and smoothly. For a free, no obligation estimate, contact us at info@peterboroughmovers.com. Get your belongings on time. We’re with you, wherever you need to go. 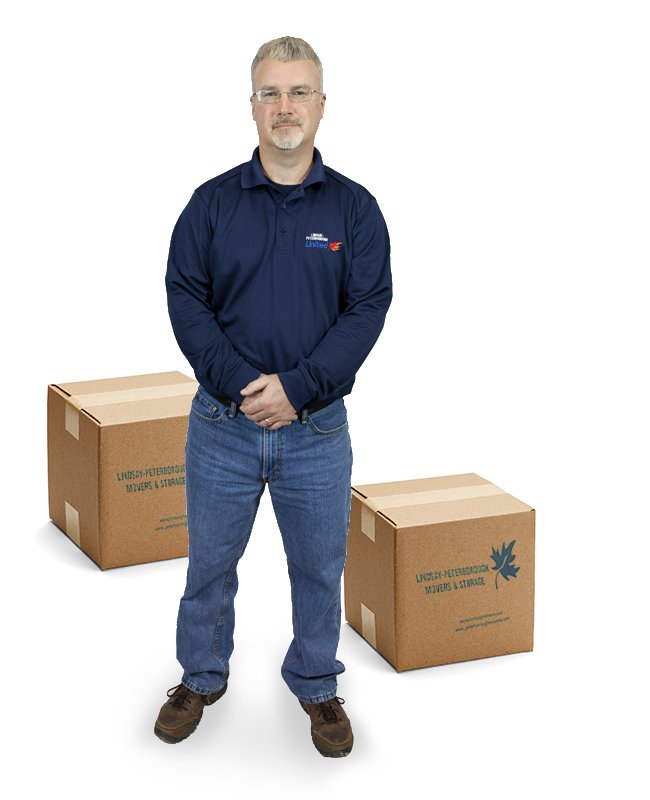 Within Ontario, across Canada or around the world, we are here to ensure your move goes smoothly. Our Lindsay-Peterborough Movers & Storage Consultants can answer any questions you may have about the moving process, discuss shipment protection options , and provide you with a professional cost estimate based on the weight of your cargo and distance that must be travelled. If your new home isn’t immediately available, we can also arrange for the storage of your belongings in a warehouse or in shipping containers. Click here for United Van Lines handy distance calculator for Canadian cities. Packing up a household can be a challenge. Our staff is trained to prepare and pack your belongings to ensure your goods are safely stored and insured for your move. If you’d prefer to do it yourself, we make it easy by carrying a wide selection of packing materials, available at a low price. Need a place to store your items? Short term and long term storage is available in insured, climate-controlled warehouses. If you require longer-term storage, goods can be packed into containers to minimize handling. Mini-store units are also available to rent. If you’re moving on a budget, undergoing renovations, need temporary storage, or prefer to do it yourself, we offer container moving solutions to make things easy. Making a move of 700 miles (1,126 kilometers) or more within Canada? You have the choice of shipping your household goods by either van or container service. If you choose to move by container, an Exclusive Use Option guarantees that your contents will be kept separate from other shipments in your own personal, 8', 9' or 12’ United Container. Choosing a container service offers a number of unique benefits, including flexible delivery options such as expedited or delayed delivery, based on your needs. Containers are also an excellent and affordable short-term storage solution (up to 90 days) if you are unable to move into your new home right away. Because your shipment is stored in the container it was initially loaded in, this means less handling, reducing the chance of accidental damage to contents. Moving to the United States requires a good understanding of your responsibilities, documentation requirements, and what to expect at Canada/U.S. Customs in order to avoid unnecessary delays and/or having your shipment held up at the border. Did you know that when you move from Canada to the U.S. it is not necessary for you to be present when your goods cross the border? You must, however, enter the U.S. and declare your residency before your shipment can be admitted. Both countries have specific regulations regarding the items you can or can't import and a list of items that are prohibited. To help you achieve a successful move, your United Moving Consultant will not only provide you with all necessary Customs forms, but provide guidance on how to accurately complete them. Please take extra care to ensure that passports, birth certificates, photo IDs and social insurance/security numbers for each family member crossing the border are up to date. With our global reach and personal service, we can move you anywhere in the world. Careful planning is vital when moving overseas. In fact, it can make all the difference in the world. That's why tens of thousands of families entrust their overseas moves to MoverOne International , the experts in global moving and transportation services. With more than 1,200 representatives, our global network is found in all of the world's major centres. In addition to offering full-service overseas packing and delivery services, container services, and air freight, we can also deliver a comprehensive array of fee-based relocation services to complement your move, including information about your destination, cross-cultural and language training, visa processing, school searching, housing assistance and other settling-in services. For more information on how we can help you during your move overseas contact us at 1-800-363-1641. The special commodity division is where you receive "Special Service"
These two words are what this division is about. We recognize that your products, equipment and treasures require special service. From your first contact with our dedicated Special Commodity Co-ordinator you will receive the care and the right equipment to move your special commodities safely throughout North America. All our drivers and support crew are trained for pad-wrap service and have years of experience as part of our team. Weekly LTL service throughout North America. Do-It-Yourself Packing On a buget? Container Solutions Over 700 miles?